Online poker games. What started as a mere popup irritant, gaudy ads bombarding you when you were just trying to check your email, has grown into a huge industry. No longer the sole territory of hardened betting types, the online poker room has opened the game up to anyone with the will to pay, the skills to play – and just a little bit of luck. If you’re new to the world of online poker, here’s a brief guide to get you going. 1. First, choose a reputable online casino or poker dedicated website. Until you know the market well, it’s best to stick with larger companies. They are easier to research and find reviews and testimonials for. Read other users comments thoroughly and try to separate the marketing content put out by the company from comments from real players. Many sites require you to download software – another good reason to go with a trustworthy company. Try skypoker.com, which offers free online poker for beginners. This should help get you started. 2. Once you’ve selected a reputable site, it is important to treat any introductory bonuses as you would your own chips. While you should always stick to staking no more than you can afford to lose when you play poker, the ultimate aim of the game is of course to win and not lose chips overall. 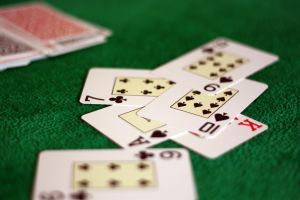 Chucking it around – or in poker parlance playing fast and loose – will impress no-one, and will most often simply line the pockets of the other players at the table. 3. Choose your game wisely. Most sites offer a range of options, from classic Texas Holdem up to weirder variations you may not be familiar with. Do your research and make sure you know the poker variant you intend to play inside out. Would you like to play against other players or go for a computerized opponent? It’s up to you, but think about your choice carefully – you don’t want to go into a money game with insufficient experience. 4. Play for fun? Admittedly, playing poker without betting money doesn’t really constitute gambling. Nevertheless, it can be great fun and certainly gets you well practised for moving into real games with cash at stake. Most online poker rooms have a practice mode so you can test the waters before laying any money down. 4. Learn the rules properly! It pays – literally – to have a good grasp of any game before you begin playing. Of course, luck is a factor in online poker but, unlike a lot of other card and casino games, skill plays an important part. 5. Position yourself. If you get the advantage of acting last after the flop, use it. You get to see the opposing players’ move before you have to decide yours. From this position, you can win more with your good hands and simply fold when it’s not so good. The beauty of heads up poker is that you’ll be in this situation on every other turn. 6. Finally, for goodness sake enjoy yourself. This is really what the online poker experience is meant to be all about: opening up new worlds of entertainment to people who would never have dreamt of going into a real poker game. Online poker allows you to get good without being intimidated by seasoned players round a table. All Slots Online Casino – where the fun starts!